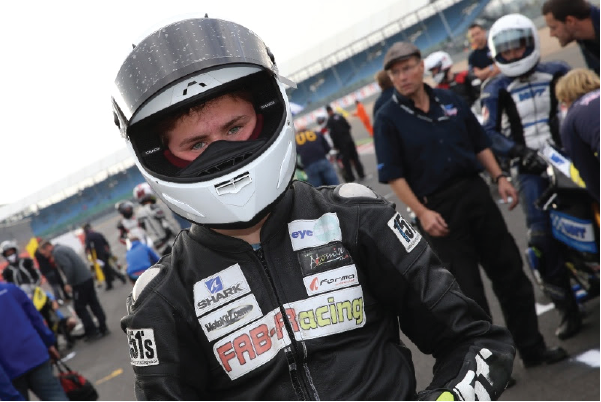 It was a weekend to forget for Lewisham’s Cameron Horsman after mechanical issues plagued the 14 year old all weekend long, forcing DNF’s in both races. The weekend couldn’t have started worse for the 14 year old. Having never seen the circuit before he needed laps, but during the free practice session his chain broke, forcing him to only complete three laps after the bike was recovered from the circuit, and a new chain fitted. The first qualifying session on Friday afternoon had similar fortunes for Horsman, where a mechanical issue cut short his session after just one lap, forcing the team to work hard into the night to rebuild the bike. But come Saturday morning, Cameron was looking for revenge after the difficult start to the weekend. Qualifying two saw him post a 2:26 lap, good enough to line him up 4th fastest 125 machine, and overall 20th place, on his second lap of the session, proving he’d learnt the track in a short space of time. Saturday’s sprint race saw Cameron get a great start, and he ran as the fourth 125 and began to chase the group ahead down. But then, once again, yet another mechanical failure saw Horsman have to pull out of the race on the first lap. Overnight the team worked once again to rebuild the bike to give Cameron the chance of winning his seventh race of the season. Due to the issue with the bike in race one, his lap time from qualifying would drop him to 26th as others in the first race went quicker. But as the lights went out Horsman once again made his trademark good start, and went about picking off the riders ahead. But then, after just four laps the bike stopped once again, this time an electrical fault. Cameron has dropped to fifth position of the Hel British Motostar Championship on 228 points, eight points ahead of Wesley Jonker in sixth. 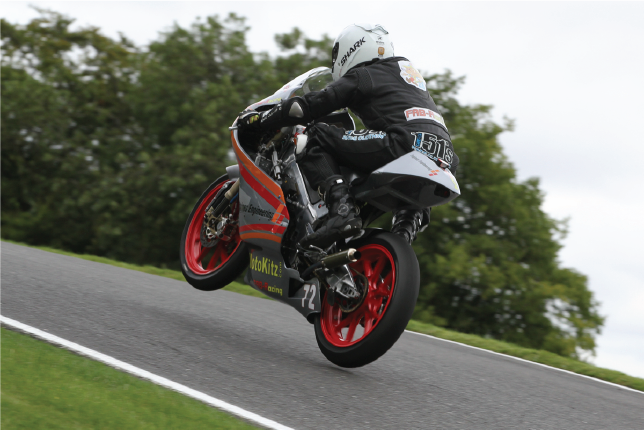 14 year old Cameron Horsman took his fourth win of the season at Cadwell Park, before crashing out in race two in wet conditions. 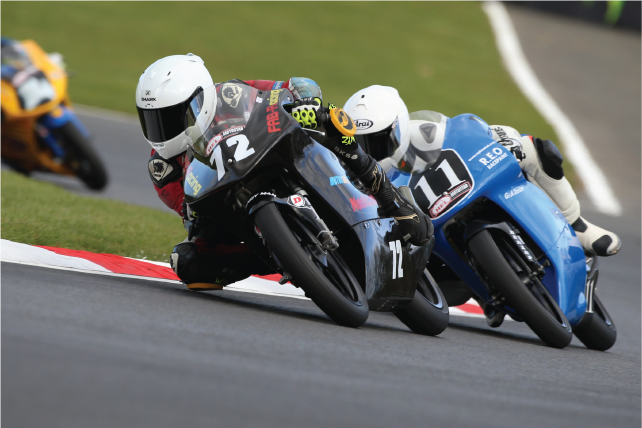 Cameron came into the eighth round of the Hel British Motostar Championship high in confidence, and only four points behind fifth place in the title battle. The free practice session on Friday morning saw Cameron fly out the blocks, lapping the second quickest 125 machine, only seven tenths behind the first quickest 125 in the form of Josh Owens. After both qualifying sessions Cameron lapped a second quicker, posting a 1:38.711 to place him in 17th on the grid, and only two places behind the pole man for the 125 class. From the start Cameron got a great leap from the line and instantly passed Josh Owens, taking the lead of the 125 race. Cameron battled he way up to 12th position, and the remained in the lead of the 125 race until he took the flag, taking his fourth win of the season, and leaping into fourth position of the 125 Championship. Race two would see Cameron jump up one place into 16th on the grid, but just minutes before the start of the race, rain started to fall forcing the riders to switch to wet tyres. After a six minute wet practice the riders lined up on the grid for the 10 lap feature race. Cameron got a great launch once again and battled hard with Josh Owens, the Lewisham man worked his way past and started to make a gap between him and the championship leader Owens. The wet conditions weren’t fazing the 14 year old and he was lapping a full second quicker than the group ahead, until he high sided himself coming out of hall bends as the rain became heavier on lap four, crashing out of the lead of the 125 race. After the race Horsman said: “That is really frustrating because I had much better pace than Josh and the others in front, and I felt so comfortable as well. I just came through hall bends and the circuit had become a lot worse with the wet conditions and I wasn’t expecting it, I got on the gas and it spat me off. Cameron now sits in fifth in the Hel British Motostar Championship on 153 points, only 59 points behind third place Mark Clayton. Cameron now has a two-week break before heading to Oulton Park for round nine of the Championship. 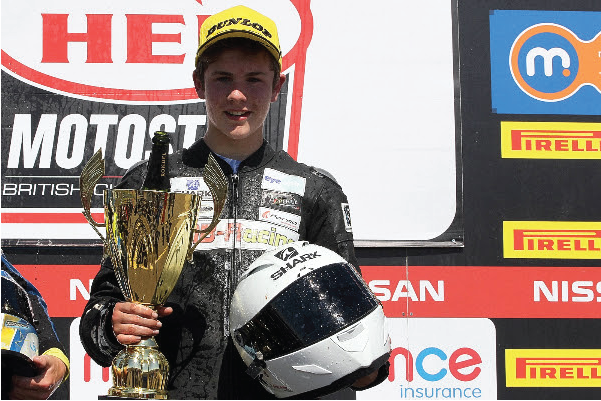 14 year old Cameron Horsman took his third win of his rookie season in the Motostar class, on his first ever visit to the fast Hampshire track last weekend. 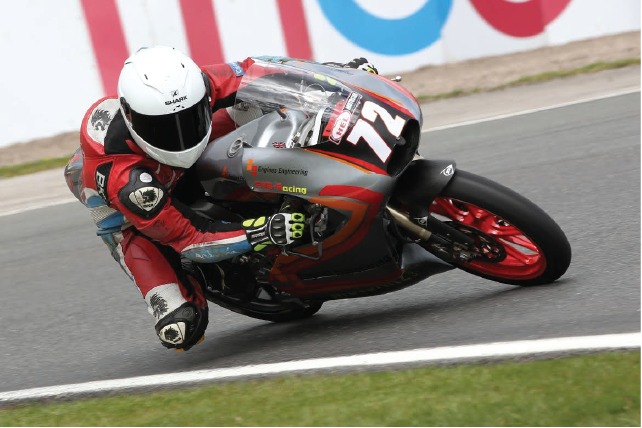 Cameron headed into the seventh round of the Hel British Motostar high in confidence after his home round win two weeks ago, and wanted more of the same from his EE125 machine. The free practice session didn’t go to plan for Cameron after a mechanical problem cut his session after only six laps. But the afternoon session was far kinder to Cameron as he posted a time of a 1:25.8, placing him the third quickest 125 machine and provisionally lining him up 19th on the grid, after working hard with his suspension technicians, 100% suspension, with one more qualifying session remaining. Sadly in Q2 Cameron couldn’t improve on his time set in the first session, meaning that he would drop to 23rd on the grid, and sixth 125. Race one on Saturday saw Cameron fail to start the race due a mechanical issue, but the team worked hard to find the problem ahead of the morning warm up on Sunday. After a positive eight-minute warm up which saw Cameron finish the session in 19th and fourth quickest 125, he felt confident with his machine and knew he could achieve a good result in the race. After failing to post a lap time in the first race, Cameron would start from the back row of the grid race two. He made a great leap off the line and ran as the second 125, fending off battles from Brian Slooten and Liam Delves. On the final lap Cameron rode hard posting his fastest lap of the weekend, and took the flag as the first 125 after Josh Owens crashed out. After the weekend Cameron said: “This weekend has been a tough one, we’ve had a few problems but the team have worked hard to overcome them. I got a really good start and picked my way through the pack, I was comfortable and the bike felt really good. I’m over the moon to take another victory and I can’t believe how much I’ve grown this year, and the bike is feeling mine now. Cameron now moves onto 128 points in the 125cc Championship. Friday’s free practice session saw Cameron work hard on the circuit, and with the setup of his former grand prix machine. The 13 year old lapped the 2.4-mile circuit in a time of 1:41.839, placing him the fourth quickest 125 and only 2.2 seconds behind the quickest man in his class. Come the afternoon’s first qualifying session, Cameron improved further in time by 1.1 seconds, posting a 1:39.928 provisionally lining him up in 20th place, and third quickest 125, with one more session left to improve on his time before Saturday’s sprint race. Cameron worked hard all through the final qualifying session on Saturday morning, but he just couldn’t improve on his time set in Q1, as others behind him did improve in time the 13-year-old Horsman was bumped down the grid to 24th. From the start of the race Cameron got a great leap and by the end of the first lap he was running second in the 125 class, and battling hard to work his way up to the leader of the class, Josh Owens. Cameron was then embroiled in a battle with Ryan Longshaw, but he did well and kept second position as he crossed the line to take his second podium in as many races. In the feature race on Sunday, Cameron got an even better start and ran as the first 125 after the first few laps, and was then in a battle with the 125 championship leader in the form of Josh Owens. After swapping places all race, Cameron had the lead when the red flag came out and forced the race to be stopped, taking his second win in three races. After the weekend a happy Horsman said: “This weekend has been great, to take a second and a win at my home circuit is just truly brilliant. I’m feeling more comfortable on the bike every time I go out, and that is just what I want. To win at my home circuit is fantastic, and to do in front of my family and my Dad makes it extra special. 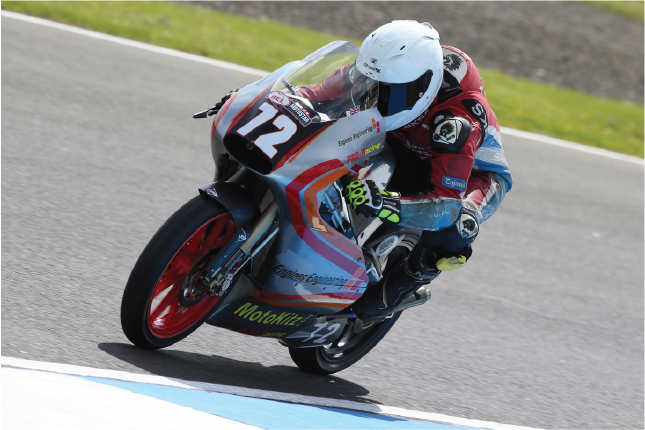 13 year old Cameron Horsman took his maiden win in the Hel British Motostar class this weekend at Knockhill, after an up and down weekend on his first visit. 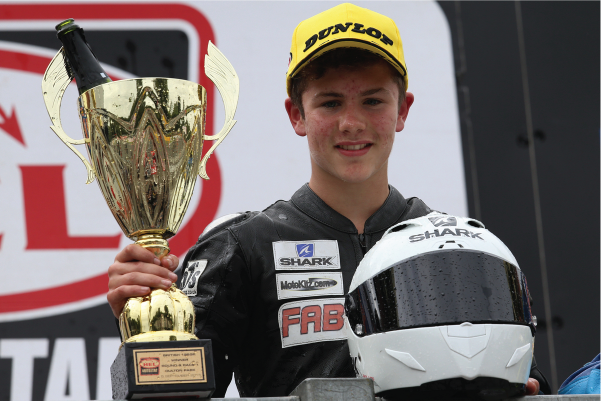 After his learning curve two weeks ago at the Snetterton 300 circuit, where he achieved his first finish onboard the EE125 machine, Cameron headed north and to the Knockhill circuit in high sprits, and excited about the prospect of learning a new circuit. In the afternoon first qualifying session Cameron, improved in time and also his feeling with the bike to post a 57:100, placing him provisionally in 25th position on the grid, and seventh quickest 125, only six tenths of a second behind the third quickest 125. After a major delay to proceedings due to heavy rain forcing issues with the track, which had to be repaired and was done with ease and in good time. 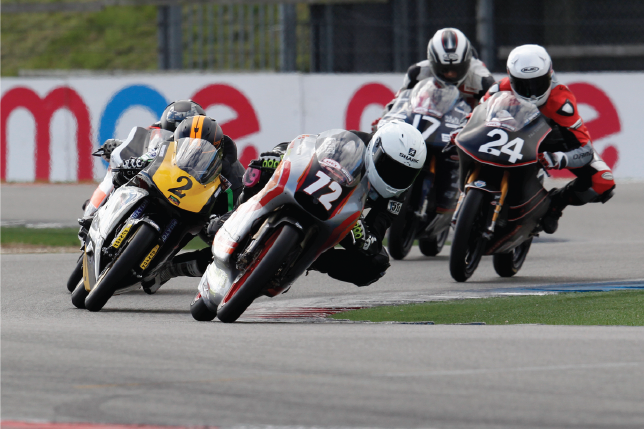 The motostar race was pushed back in time. And from the launch from the lights Cameron got a great start, and after the first lap he was running in second place in the 125 class, until a mechanical issue on lap four forced him to retire, but they were positive signs ahead of the feature race on Sunday. During Sunday’s morning warm up, Cameron pushed too hard and unfortunately crashed, but luckily with minimal damage. Prior to the race on Sunday afternoon, the heaven opened, forcing a delay to the race. But when the lights went out Cameron got a great launch off the line and ran as the first 125 after the first lap. After battling hard with Josh Owens, Cameron got the better of him for the lead of the 125 class, and took the win by five seconds from Owens, his maiden win on the EE125. After the race Cameron said: “That was amazing. I tried so hard from the start and the battle with Josh was fantastic, and to get the better of him and come away with my first win is brilliant. This weekend has been up and down really, and this is my first time here as well, we worked hard in free practice and qualifying, but the crash in warm up didn’t dent my confidence. “I just want to thank everyone involved, because without them I wouldn’t be standing on the top step this weekend. Roberto, my Dad and Rob have worked so hard on the bike, and without them and Roger none of this would be possible. 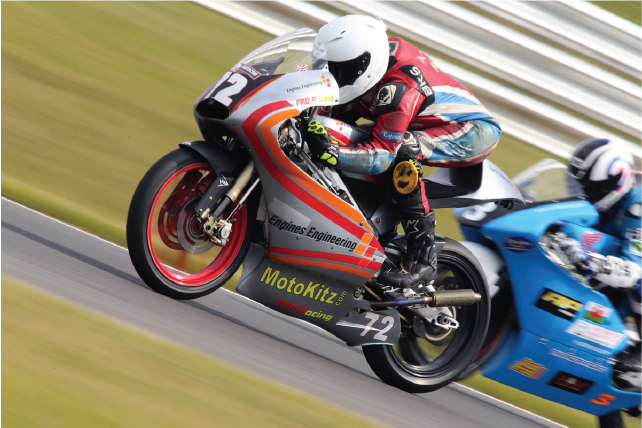 Cameron Horsman achieved his first finish on board the EE125 machine this weekend at Snetterton in Sunday’s feature race, also posting his fastest lap of the weekend in the process. After the annual long break for the road-racing calendar, Cameron Horsman returned to action onboard his EE125 at the Snetterton 300 circuit, searching for his first points on board the former grand prix machine. Friday saw Cameron improve in time after every lap of the free practice session. But for the afternoon, an issue with the bike put Cameron’s progress back a little, failing to complete a lap in the first qualifying session. Come Saturday, Cameron was determined to set a lap time to put him on the grid for Saturday afternoon’s race, and that he, setting a lap time of 2:09.5, 1.3 seconds quicker than the time he achieved in free practice. Meaning he would line up in 30th place, ahead of many established riders in the class. Race one on Saturday afternoon saw Cameron make a great start from the line, and was embroiled in a battle with Stephen Campbell, until Campbell made a move at the hairpin and lost the front leaving Cameron no room but to run over the stricken youngster, cutting his race short after only three laps. Overnight the team made a change to the setup of the EE125, and it worked for Cameron during Sunday’s feature race. He got off to a great start once again and ran fourth in the 125 class, posting his fastest lap of the weekend in the process of a 2:08.3. But in the final laps, Cameron lost his fourth place to Andrew Sawford, crossing the line as the fifth 125 and 22nd overall. After the race Cameron said: “This weekend has been really good. I felt I could of gone a little bit quicker than I did, but I feel much more comfortable on the bike now. I was disappointed after race one, but race two has given me a lot more confidence ahead of Knockhill now, so I can’t wait to get there and see what I can do. Cameron now moves into 11th place in the 125cc Championship on 33 points. The next round of the Hel British Motostar Championship is held at the Knockhill circuit in Scotland, on the 3rd, 4th and 5th of July.